Tasting Key Lime Pie instantly makes me feel like I’m on vacation. It’s decadent, refreshing and just plain old fun. It’s possible that I have scurvy because recently I cannot get enough citrus. And not like regular old lemons and grapefruits. Fancy fruit. Last week it was kumquats. This week, key limes. The fact that they are both adorably wee versions of regular-sized fruit may have something to do with it. I admit it. I am undeniably attracted to Lilliputian produce. Now I’m going to tell you a secret about key lime pie. You actually don’t need key limes to make it. 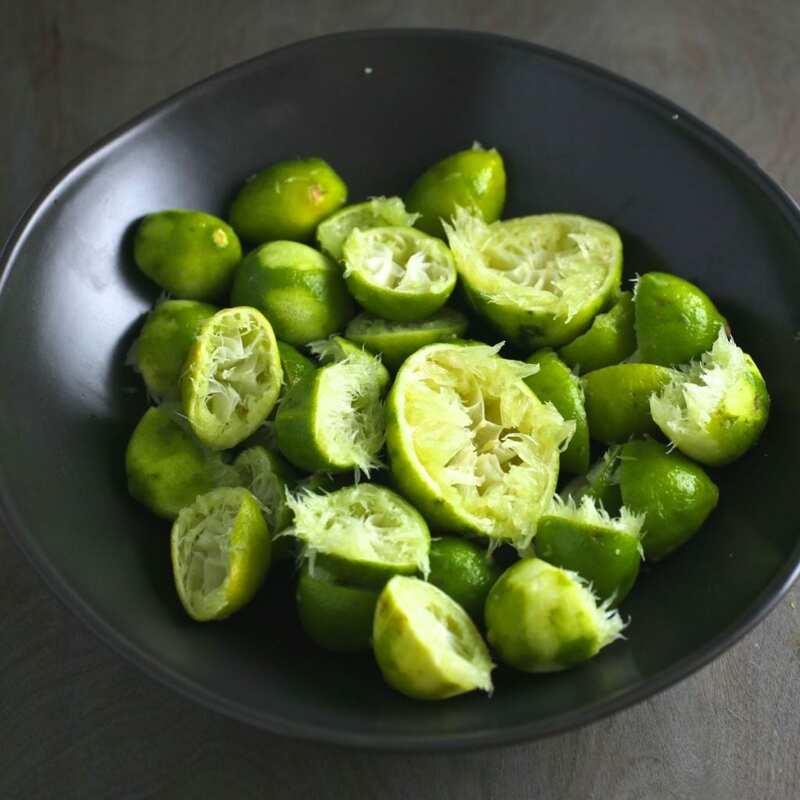 Regular, grocery-store Persian limes taste just as delicious. I had never seen fresh key limes before (and they weren’t that expensive) so I decided to go for it but don’t fret if you can’t find them. 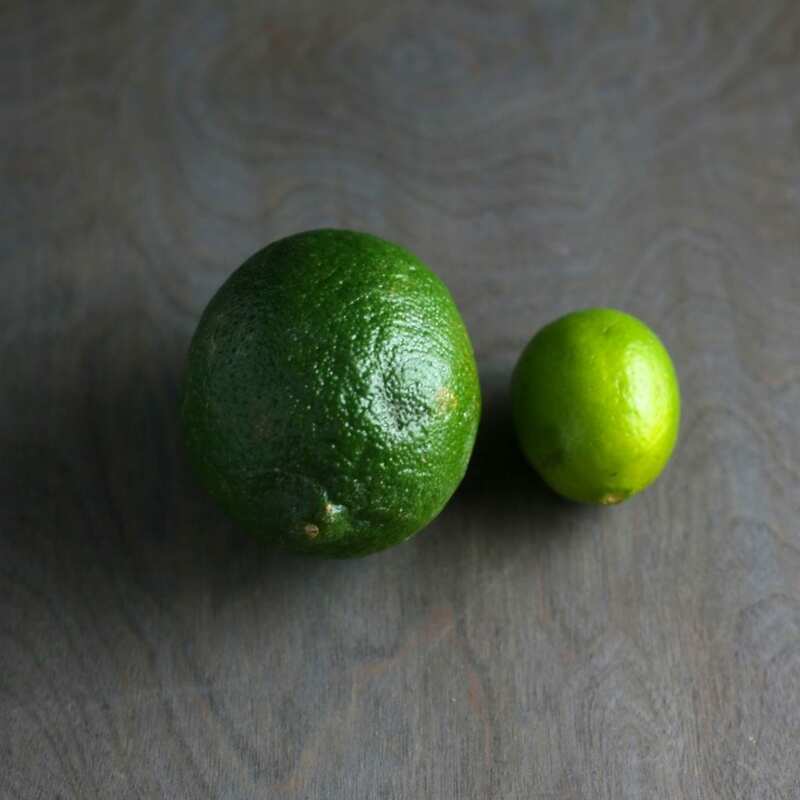 Key limes are native to the Florida Keys (shocking fact). They are smaller and have more seeds than Persians. They are also a little bit more tart, with just a hint of bitterness. Just like me! 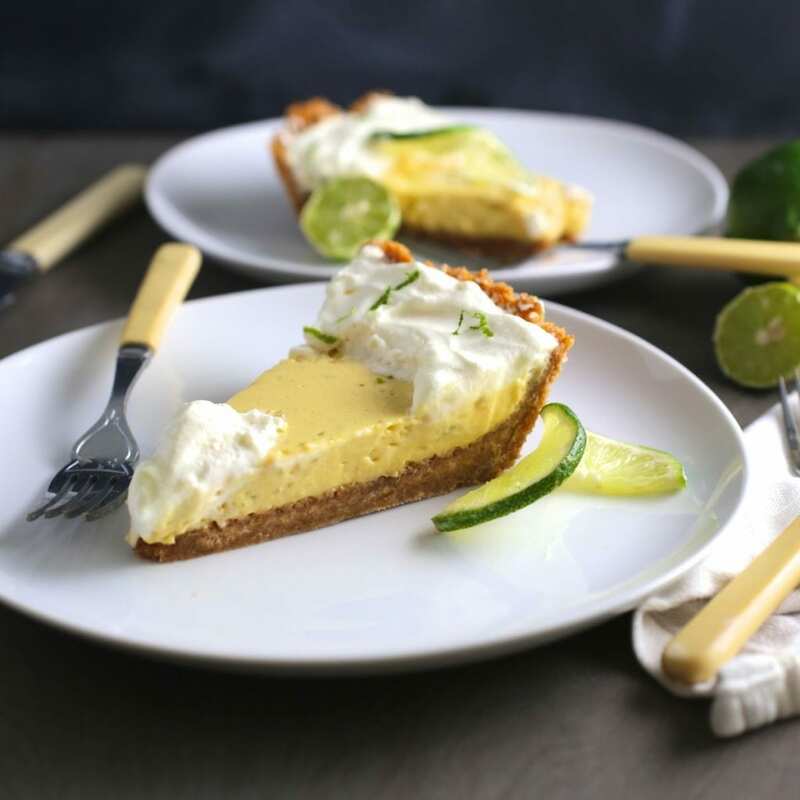 A good Key Lime Pie will have a nice balance of sweet to tart. You don’t want cloying sweetness but you also don’t want to look like a teenager preparing for a selfie after each bite. This recipe calls for whipping the egg yolks and the condensed milk for a few minutes before the juice is added. This incorporates air and makes the custard even more silky and smooth. Definitely worth the extra step. 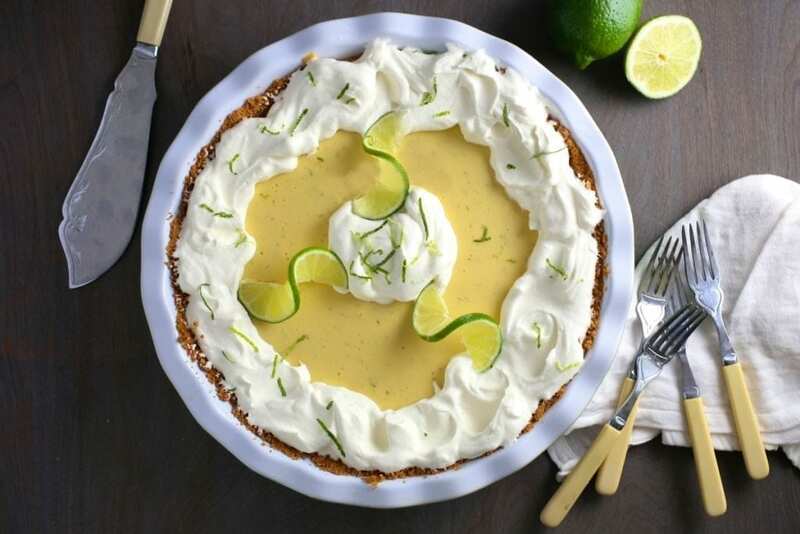 Many, many limes were injured in the making of this pie. We found that juuuuuust under 2/3 of a cup of juice was perfect, so that’s where the 9 tablespoons comes from. If you tend to like things less tart, go with 1/2 cup (8 tablespoons). Like things more tart, do the full 2/3 (10 1/2 tablespoons). Personally I’m not that fond of bottled juices but feel free to use them if you want. Maybe I just haven’t tasted a good one but I find they have a slight chemical aftertaste. But seriously, who cares what I think (unless you invite me over and then I’ll love your pie no matter where your juice came from). This pie does call for quite a bit of grated zest though so you’ll want some fresh limes anyway. And then there’s the crust. Honestly, is there anything more delightful than a buttery graham cracker crust? Especially on a key lime pie. It’s so simple but it’s so, so delicious. A little sweet, a little salty. Buttery and crunchy. Best of all? It takes absolutely no skill. [Matt says: “Can confirm. I made this.”] Crush crackers – melt butter – mix in sugar and salt – dump in pie dish – press down. For our UK readers, as usual, you can substitute digestive biscuits for the graham crackers. Whipping the eggs and milk makes the filling thick even before it’s baked. Make sure the cream is very cold before you whip it. It makes it fluffier. You can chill the bowl and beaters too if you want to be extra awesome. The little bit of corn starch in powdered sugar will help the cream hold its shape better on the pie. You can just use granulated if that’s what you have. A microplane will make quick work of all that lime zest. We probably use this tool more than any other in the kitchen. You’ll want a 9 inch pie dish (we only have a 12 inch which worked but makes the filling a bit thin). Decorate it however you like but I’m a sucker for a delicate lime twist. 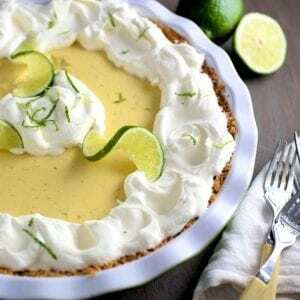 The extra thick crust becomes almost like a crunchy cookie on the bottom of the key lime pie. Make the crust: Combine cracker crumbs, sugar and salt in a medium bowl and stir until combined. Stir in the butter until it's evenly coated. 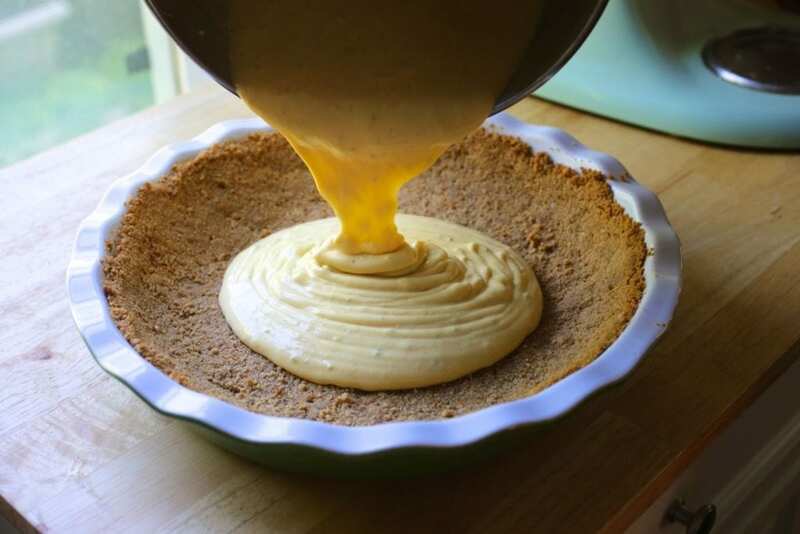 Pour crumbs into a 9 inch pie dish and press them down into the bottom and up the sides. You can use the edge of a flat-bottomed measuring cup or drinking glass to make the corners neat or just use your fingers. Bake crust for about 10 minutes, until it's just lightly browned. Set aside on cooling rack while you make the filling. Leave oven on. 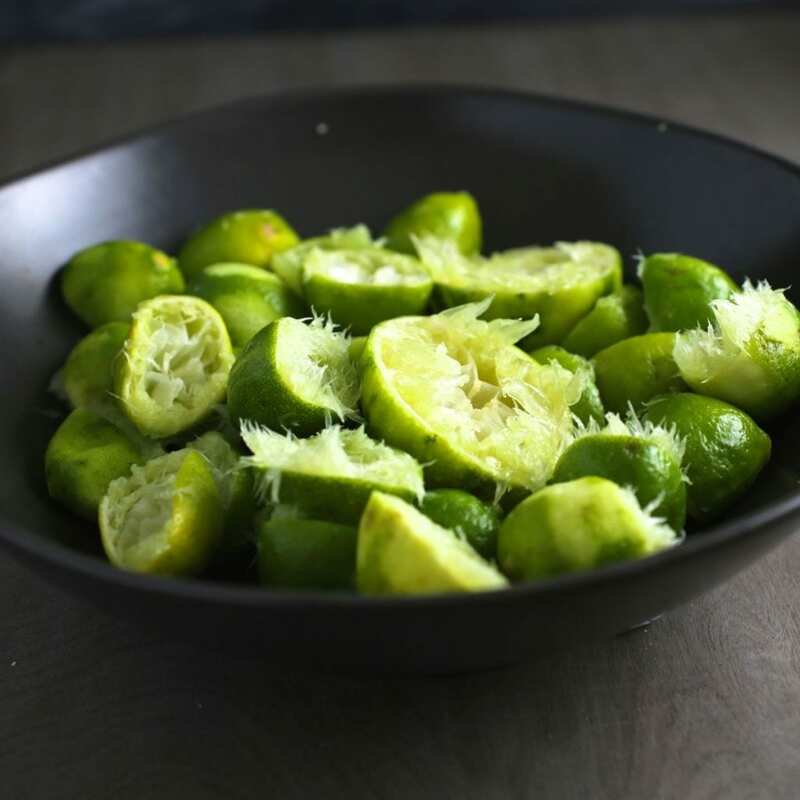 Make the filling: Zest limes using a fine grater or microplane. 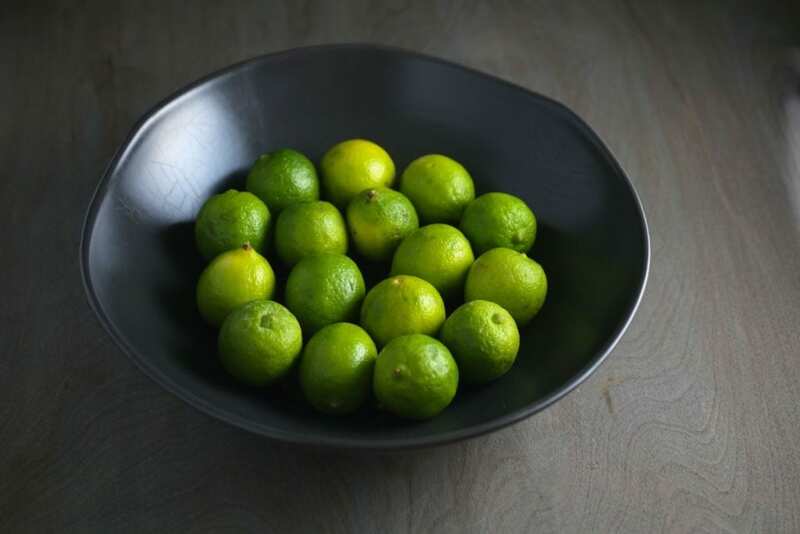 Once you have 1½ tablespoons zest, put it in the bottom of a medium bowl (or the bowl for the stand mixer). Add the yolks and using a handheld mixer or stand mixer with the paddle attachment, beat the yolks and zest until they turn pale and thick, about 4-5 minutes. Add the sweetened condensed milk and beat again until thickened, about 3 minutes more. Add the lime juice and whisk into the mixture until combined. Pour into the cooled graham crust and bake pie for about 10 minutes, until just set but not browned at all. Let pie cool for about an hour on the countertop and then refrigerate for at least 30 minutes before topping with the cream. (You can speed this process by putting the pie in the freezer for about 10 minutes or so). It should be fully cool at this stage. Make the whipped cream: Add the cream to a bowl and, using a handheld mixer or stand mixer with the whisk attachment, beat until barely thickened. Add the sugar and vanilla and continue to beat until soft peaks form. Spread around the outer rim of the pie with a dollop in the middle or just mound over the top of the pie. Chill for another 2 to 3 hours so the cream can set (if you want neat slices. If not, dig in now). Keeps in fridge for a week. Holy moly I haven’t had key lime pie in years and that is the best idea ever and I have to have some right away and it looks so good in the pictures and MY GOD I don’t want to get scurvy!!! Thank heaven I follow this post. You have exceedingly timely and health conscious updates. Please keep up this important lifesaving work. Ha! Definitely caught that scurvy JUST IN TIME! You gotta watch those pirate ailments. They’ll get ya when you’re not looking (or where you’re blind due to the eye patch). Miss you! Let’s fight off scurvy together soon (with drinks and pie). Yes yes yes pleeeease!! I need all of those things ASAP. Sooooooooon. We have a summer beat the heat plan in place you will be interested in. I’ll leave it as a cliff hanger. But bring your camera. Just saying. And pie. Bring pie. Just saying. Mystery!!! I love it! Will come with pie and camera and a love of surprises. Hi Emily! My brother and I biked across the Florida Keys in 1995. Our goal was to have key lime pie with every meal. We didn’t quite succeed, but we did gain weight on the trip! This looks amazing and brings back many sweet memories. That sounds like an AMAZING trip! I hadn’t had it in years and now I’m obsessed. So delicious!